Barco SL-9102 All Season Extension Cord with Lighted Ends and 3 Outlets - 2-Feet is OSHA D NRTL compliant. It comes with a single male plug and a 3 outlet female end. Both ends light up when power is applied. 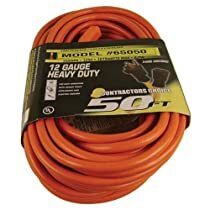 This cord is 2-feet in length with a 12/3 gauge, SJEOW cold weather-rated cord rated at 15-amps. The cord jacket provides an increased level of oil and water resistance. Barco is the established leader in next generation task lighting systems incorporating innovative technology for all types of lighting applications. Our dedicated research and development teams continually seek out innovative technical solutions for demanding professional and non-professional lighting applications. 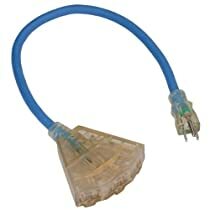 Its a three way plug and it works. That's all I need. Works as described, Light is hard to see from one side in daylight.